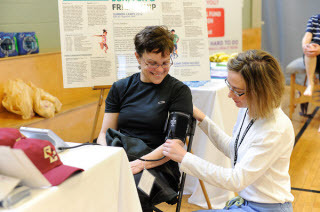 At St. Elizabeth's Medical Center, we reach beyond hospital walls, into the surrounding greater Boston communities, to address the most prevalent health- and wellness-related needs of our community members. Guided by a careful analysis of community needs, St. Elizabeth's Medical Center's Community Health Program aims to help those most vulnerable to make life-changing improvements in health and address social and economic factors that impact overall well-being. In addition, St. Elizabeth's Medical Center aims to provide culturally-sensitive, linguistically-appropriate, accessible health care services to address the cultural needs of the communities we serve. Learn more about St. Elizabeth's Medical Center's Community Benefits Plan, which includes the target populations it wishes to support, specific programs or activities that attend to the needs identified in the Community Health Needs Assessment, and measurable short- and long-term goals for each program or activity. In accordance with the Massachusetts Attorney General’s Community Benefits Guidelines, St. Elizabeth's Medical Center completed a community health needs assessment and the resulting report details the health conditions and social determinant factors affecting the people living in the cities surrounding St. Elizabeth's Medical Center, as well as the key issues the hospital needs to address in order to develop service quality, improve population health, and address cost.